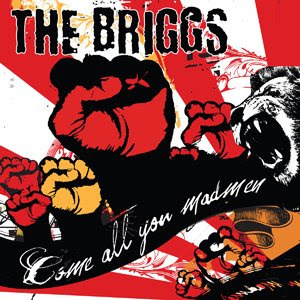 Based on their touring history and ambiguously-Irish feistiness, the Briggs could pass for a group of fierce Boston punks (and to be fair, the Los Angeles natives are joined here by Dropkick Murphy Ken Casey and Mighty Mighty Bosstone Dicky Barrett). It's near-impossible to find the band playing subject to a review that doesn't contain a term like “fist-pumping,” and based even on “Mad Men,” the rattle-and-stomp anthem of Come All You Madmen, it's safe to assume that any applicable adjective list has again narrowed. There's a bit of inconsistency with the urgency of the music itself; “Not Alone,” “Ship of Fools” and “This Ship is Now Sinking” are musically dated by about ten years, though the call-and-response of “Until Someone Gets Hurt” likely translates well live, and “Molly” is actually a lovely ballad steeped in Irish tradition. A touch corny but best of all, “This is L.A.” sums up the skin of Los Angeles, from the haze to Sunset Strip's “pay to play” venue policy, to the “10 (to the 5 to the 134),” in a united howl for home that'd make Agnostic Front proud. If only the Briggs weren't so predictably fitting for the Warped Tour. Pre-order Come All You Madmen and get an autographed poster free! Stream the whole friggin' album!